← Who are your 150? I was on two major train routes during the China trip. 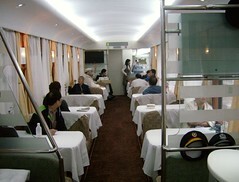 This was the dining car on the Hong Kong to Shanghai overnight train, a trip of about 1000 miles in about 30 hours. Contrary to what some had told me the train was very comfortable and also as clean as the Amtrak we’d taken from Portland to Minneapolis a few years ago. The beds were *more* comfortable and larger but unlike Amtrak did not fold into comfortable seats, rather you sit on the bottom bunk or in tiny fold down seats at the outside of your sleeper cabin. Culturally this is a good experience because most of the travellers are Chinese. Food was only fair here, and they closed the dining car after about 9pm which was a shame because it was the most comfortable place to hang out. There was even a tiny little bar at the end of the car where you’d buy the Budweiser beers I had on both trains (odd, because Tsing Tao beer and Yanzing?, a popular beer from Beijing, was at all the restaurants.